Locked yourself out of the house or got a jammed lock? While it can be tempting to try to pick or fix a lock yourself, locksmith Paul Flanagan from AHL Locksmiths in Isleworth, Middlesex strongly advises against it. Trader tip: Never attempt to open a lock using a credit card as you will damage your card and fail to open the lock. This only works in the movies! Find an accredited, qualified professional to do the job - Which? 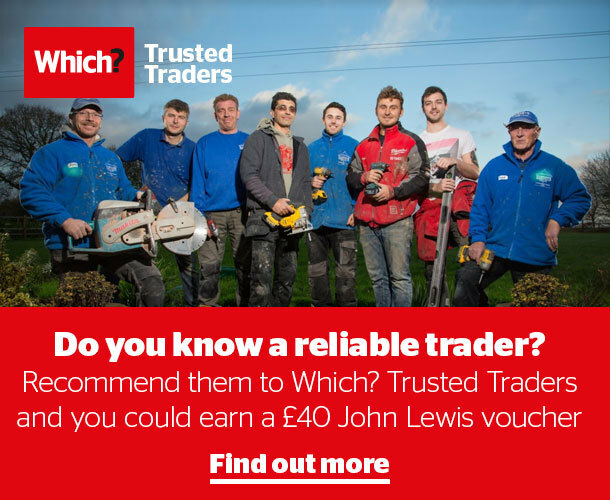 Trusted Traders have locksmiths in your area. Read on for more tips from one of our Which? Trusted traders. Prices for emergency locksmithing vary – weekend and out-of-hours call-outs usually cost more and the type, size and brand of lock must be taken into account. Higher security locks, such as those made by Banham and Ingersoll, will usually cost more to open. A locksmith may also charge extra for travel to your home and, where appropriate, for parking. These guide prices were supplied by locksmith Paul Byrne from Which? Trusted trader, Alexandra Locksmiths. Call a qualified and recommended professional, such as a locksmith from Which? Trusted Traders. You can fix a price and be sure you won’t be overcharged. 'Crooked locksmiths offering emergency services can give vulnerable customers a cheap quote and then charge more once they complete the job,' says Paul. Don’t try to buy and change these parts yourself, as you may damage the door. Be aware that retailers will sell gladly sell you a uPVC door lock unit, handle or cylinder but may not refund your money if you unsuccessfully attempt to fit the part yourself. The biggest risk and expense is failing to change the locks when you move into a new property. If you get burgled and there is no sign of damage, your insurance company may refuse to pay because you neglected to secure your home. 'This is a locksmithing job you can’t afford to neglect,' says Paul. If you have just moved in to a new home, consider installing a safe for valuable documents and items. Before hiring a locksmith, ask your insurer what ‘grade’ of lock they require. If the wrong lock is fitted, your insurance company could use it as a reason not to pay out in the event of a claim. 'Avoid a costly burglary by changing at least one lock on external doors,' says Paul. A good locksmith will give you advice about what type of lock is most appropriate. Ask them to fit a lock that meets British Standard BS 3261. Windows ought to be secured with key-operated locks in order to satisfy insurers. Read more about locks for different types of windows. 'Often, I visit customers who have attempted to force the lock with a pair of pliers or a screwdriver,' says Paul. 'This can cause extra damage to the lock.' Also, if the furniture becomes scratched or dented, there is the added expense of a cabinet maker to repair the damage. Check the keys for all of the locks in your home, particularly antique keys. A damaged key will jam your lock, resulting in an unnecessary visit from a locksmith. 'A good locksmith can pick the lock very easily, without causing further damage to your antique cabinet,' says Paul. Call three locksmiths and ask for a fixed price quote.